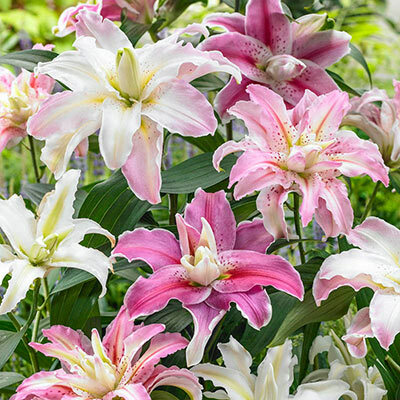 Double oriental lilies make fabulous cut flowers, the showy second row of petals takes the place of messy anthers. They're also very fragrant which is a treat both in the landscape and the home. 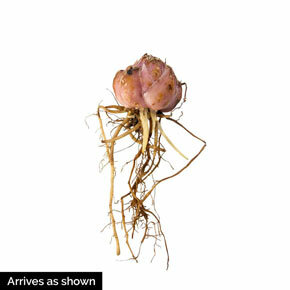 They're borne on the ideal easy-to-grow plant—tough, resilient, hardy and beautiful. That's why they're a cinch for naturalizing and perennializing. With this mix, you'll get 5 double oriental lilies, perfect for filling out your cutting garden or perennial border. We have added only top-quality varieties to the mix, and they will be picked randomly. So you may have 5 different varieties or some multiples, but either way, you know you're going to get a beautiful show.